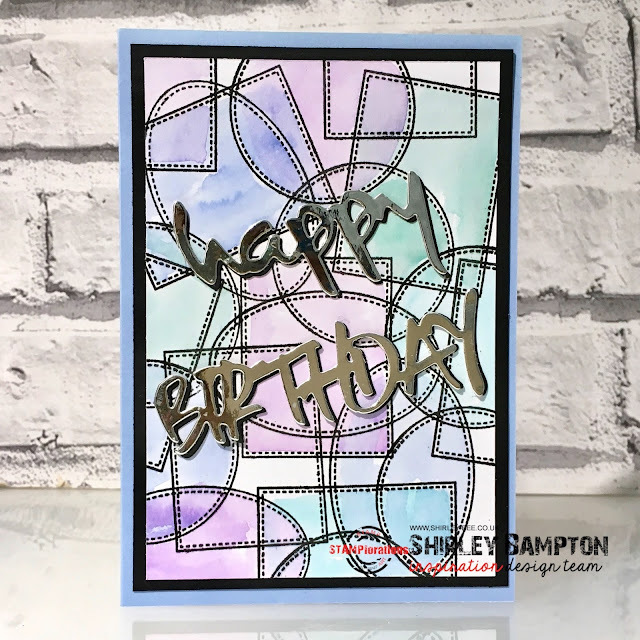 It's Inspiration Tuesday at STAMPlorations, and this week we're featuring Dee's Artsy Impressions stamps, with 10% off any of Deepti's stamps and 20% off Kathryn and Christmas set - no coupon needed. I need more male birthday cards, so I used the three frames from the Frames and Flowers set to create a masculine background on white card, then watercoloured with Distress Inks in blues, purples and greens. I matted this onto a black panel then mounted it to my card base. Diecut the sentiment from silver card and black card, slightly offsetting the black underneath - it's much more visible IRL. Then pop on over to browse Deepti's stamp collection. If you my code STAMPGIRLSHIRLEY you'll get an extra 20% off these or any other stamps, dies and stencils in the store, even on sale prices, yay! Love all of the different designs. Makes for a fun card. Fabulous and festive birthday card! Love it. Fabulous collage of colors, shapes, frames and design! BTW, I noticed the black offset on the sentiments right off the hop...it really does add the perfect bit of definition to the sentiments! Very, very cool. Love DI as watercolors. very cool card...I like the look.